The introduction of Home Direct for horses follows the success of the national pet charity’s home direct for small animals which was introduced in 2010. Homing horses direct can reduce stress for both horse and owner and means the charity can keep valuable space free at its centres, ready for any neglect and abandonment cases that are in urgent need of expert care. Equine charities are currently receiving large numbers of calls every month from horse owners seeking alternative homes for their animals. There are over one million horses and donkeys in the UK and the charitable sector has limited space available and must prioritise welfare and rescue cases. Home Direct adds another string to Blue Cross’s rehoming bow to help them support the ongoing care of even more horses. The system is simple and is already providing to be very effective with almost 100 horses helped since it was launched for horses on a pilot scheme basis back in 2015. Every horse is assessed thoroughly by a member of the Blue Cross horse unit team and then advertised on the charity’s website. Once a potential new owner has been found Blue Cross will arrange and oversee initial visits. If it’s a good match, the horse will then be rehomed. All the home visits and checks will be completed as if the horse was a centre horse. “We receive daily emails from owners who are unable to keep their horses any longer, says Emily Lambert, Rehoming Coordinator at Blue Cross. “The reason may be anything from the owner’s failing health to horses that cannot no longer be ridden. 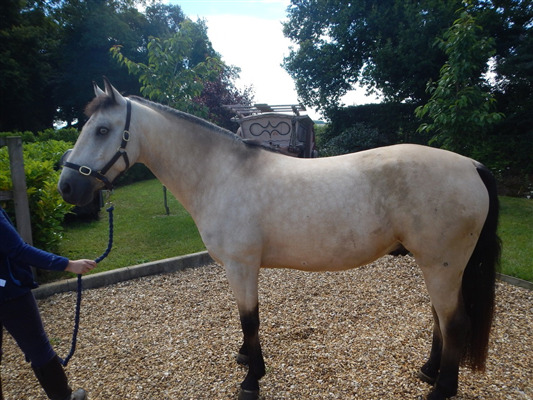 Biscuit was originally bought for a young girl to ride but it soon became apparent he had behavioural problems. He underwent treatment for sarcoids whilst in the home and had surgery on both hind legs for suspensory desmitis but despite his treatment it was apparent he was never going to be suitable for ridden work. In less than a month he was rehomed as a companion via the Home Direct scheme. When his owner’s health deteriorated three years later Biscuit benefited from Home Direct again and is now living happily as a companion to a riding horse in Hereford. Romeo and Harry’s owner had to give up her precious Welsh ponies when she separated from her husband and had to sell her land. She contacted Blue Cross and both ponies were found new homes via Home Direct. Romeo is loving life as a driving pony and Harry’s a companion and a show pony in the making! Romeo and Harry’s owner loved the process of Home Direct as it enabled her to meet the ponies’ new borrowers and discuss their history and suitability for their new roles. “We would much rather people approach us whilst their horses are still healthy than risk them being passed form pillar to post and potentially ending up in a welfare compromised situation and making more work for charities,” says Emily. Blue Cross is now offering their Home Direct service to other equine welfare charities that don’t specialise in rehoming.